If your little ones watch CBeebies then there is a chance that they watch Chuggington. James is a huge fan of the show and loves watching it regularly. We were recently sent a toy from the Chuggington Wooden Railway to review as part of our Christmas guide. We were sent the Over and Under set. It is a fantastic toy to introduce little ones to the wonderful world of Chuggington. The track is made from solid pieces of wood that are very well made. They fit well together so the track stays together whilst playing and as they are chunky they’re ideal for small hands. The set contains 22 pieces and comes with two Chuggers – Wilson and Koko. Other engines can be bought separately priced at £7.99 each. The engines are also made from wood but have plastic wheels and a magnet on the front and back so they can join together. The set fits together in a figure of 8 track. The Over and Under set. It features a 2-in-1 Clock Tower which you can either stack to make a tower or have 2 separate tunnels. 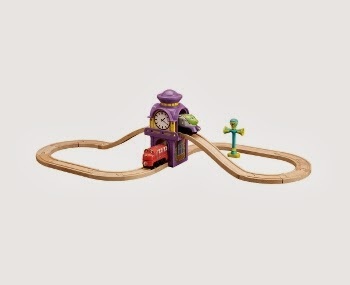 You can purchase this track for £39.99 from Tomy along with other tracks and items that can be added to your track. Tomy has very kindly given me an Over and Under set to giveaway to one of my readers. If you would like the chance to win this amazing prize simply fill out the Rafflecopter form below. A winner will be chosen at random after the closing date. Harrison – my nephews name! Hoot and Toot are my favourite.